An exceptionally quiet day of weather on the Subcontinent. What we were apprenhensive of, has actually happened ! We discussed in one of my blogs, a few days ago, about the monsoon actually "retracting" after the onset. And , now , I feel, after seting in along the west coast upto Ratnagiri, it has almost become dormant in all of coastal Karnataka, Goa and south Konkan (the area mentioned as Monsoon Set). Why ? Already discussed yesterday. Whats there to look ahead now ? Without any "technical" elaborations, in brief, I would say, a continuation of the present conditions in the west coast, except Kerala, till at least the 14th. Because, I see no system developing till the 14th. either side of the Indian Peninsula. Quite clearly seen and justified in the COLA forecast for the next 15 days. The first 8 days are devoid of any meaningfull rains north of the Kerala coast, and inland into the interiors of central and western India. Also, forecasts of the MJO show the dry phase dominating for another week or so. Mumbai, expect very light passing drizzles till the 14th. 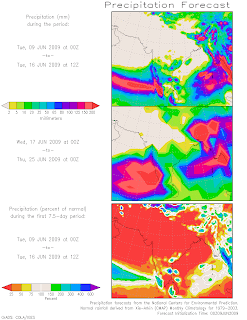 Infact, only a total accumalated rainfall of only 5 mms is estimated in Mumbai till the 14th. Normal for this period should be at least 55 mms. Gujarat and other regions north of Mumbai will have to wait even beyond the 15th.